California’s attorney general Jerry Brown believes there are three people responsible for the drug fueled demise of the late Anna Nicole Smith, but he points the finger at one of them more than the other two. “This was done knowingly and this was done with tragic consequences,” Brown told a news conference a day after felony charges were filed against Stern, 40, and two doctors, Sandeep Kapoor, 40, and Khristine Eroshevich, 61. Brown went on to say that Anna’s tragic death, as well as the prosecution of the three men, should send a message to the public that doctors and pharmacists can be just as dangerous as your local street drug pusher. That was this morning. By this evening Howard K. Stern supporters were saying their piece. 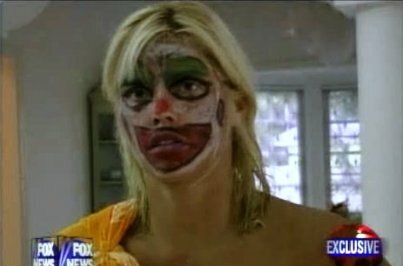 Krista Barth was Howard K. Stern’s lawyer two years ago when he was fighting for Anna Nicole’s remains. She says that Howard K. is actually a victim in all this, and not the felon the public makes him out to be. I don’t believe for one second that Howard K. stern is an innocent man. But that’s just me. Remember the clown video? I’m just sayin’. Oh yeah, there’s this picture too.